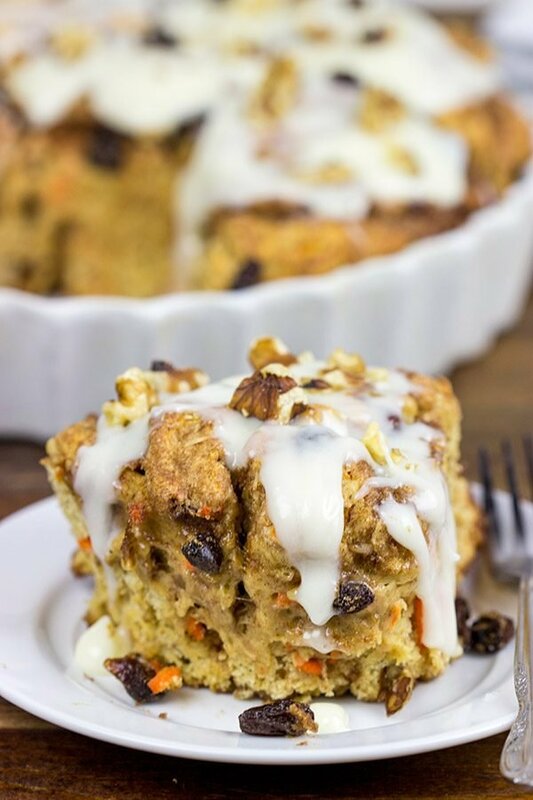 These Easy Carrot Cake Cinnamon Rolls are perfect for breakfast…especially when topped with a cream cheese frosting! Starting in about late August, I tried pulling a bunch or two of carrots every couple of weeks…but I was always pretty disappointed. Then I was out there cleaning up the garden for the winter, and I happened to notice that carrots were peeking up through the ground on several of the bunches. Sure enough, I had some legit carrots! Those carrots look like they might have grown on the Island of Misfit Toys, but they’re still legit carrots! And when faced with a pile of carrots, I decided the only logical solution was to bake a batch of these Easy Carrot Cake Cinnamon Rolls. #BakersDilemma Speaking of these Easy Carrot Cake Cinnamon Rolls, I have to admit that I was rather skeptical about them. I got the recipe from a friend who was telling me that she hates baking with yeast. (I personally love yeasted cinnamon rolls, and I thought that was the only way to make cinnamon rolls.) 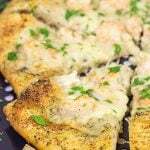 Instead of using yeast to leaven the dough, this recipe uses a combination of baking powder and baking soda. And you know what? It works! Laura described these Easy Carrot Cake Cinnamon Rolls as being a bit more cake-like, but that’s ok by us. They were delicious…especially when topped with a cream cheese frosting! These Easy Carrot Cake Cinnamon Rolls still require a bit of time to make, but you don’t have to account for letting the dough rise. In fact, after making the dough and rolling it into a log, I was a bit worried. There is a lot of deliciousness stuffed into these cinnamon rolls, and the log of dough was rather large. But I sliced it up and laid the rolls into a greased baking pan. The rolls literally filled the entire pan. Like I kinda had to squeeze them into the pan. As I’m used to yeasted cinnamon rolls, I was certain that I would open the oven door to find that the rolls had escaped and run amok all over the place. (Amok! Amok! Amok!) But nope. Not at all! These Easy Carrot Cake Cinnamon Rolls did rise just slightly while baking, but they didn’t escape the pan. If you’re looking for a fun (and super delicious!) weekend breakfast, give these cinnamon rolls a shot. 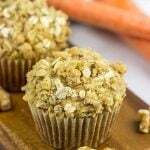 They’re a combination of cinnamon rolls and carrot cake, and they’re quite delicious! Cheers, friends! Preheat oven to 425°F. Grease and flour (or spray with nonstick spray) a 9” round cake pan. Using a large bowl, combine all of the dry ingredients for the dough (flour, brown sugar, baking powder, baking soda, salt, cinnamon and nutmeg). Add buttermilk, carrots and 2 Tbsp of the melted butter; stir until smooth. Turn dough out onto a well-floured countertop or large cutting board. Sprinkle top of dough with flour and then roll into 9”x12” rectangle. Brush the top of the dough with the remaining 2 Tbsp of melted butter. Using a small bowl, combine all of the Filling ingredients (brown sugar, granulated sugar, cinnamon, walnuts and raisins). 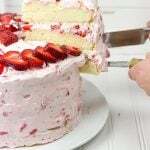 Sprinkle this mixture evenly over the dough, leaving a ½” border on all sides. Starting with a short end, roll dough tightly into a log; pinch seam to seal dough. Slice log into 8 pieces. Lay pieces cut-side up in prepared baking pan. Bake for 22-25 minutes, or until golden brown. Remove rolls from oven and let cool slightly. 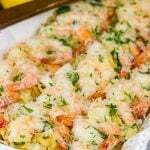 While rolls are cooling, make the glaze by whisking together the cream cheese and butter until smooth. Add the powdered sugar, milk and vanilla; whisk until smooth. Spread glaze over warm rolls and serve. Good for you for growing your own carrots!! We are still experimenting in our little garden to see what grows well and what doesn’t. We tried beets last year and normally they would grow well in our climate, but they didn’t for us. Going to try cauliflower this year! Fingers crossed! 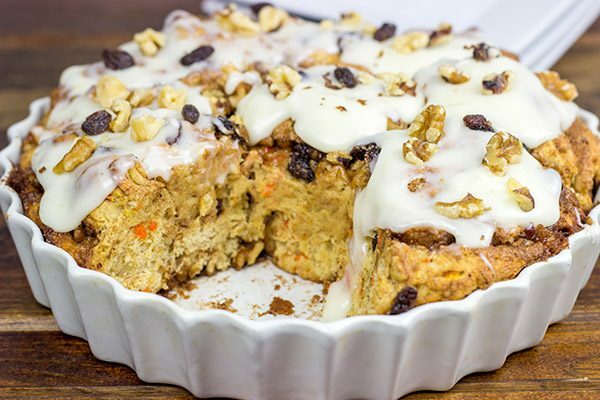 This is a brilliant idea combining a couple of my faves – cinnamon rolls and carrot cake. I bet these taste SO good!! So perfect for Easter too. Happy Monday, David! We tried beets a few years ago, too. We got a few small ones, but I think our problem was not thinning ’em out when they first sprouted. I know thinning is important, but I didn’t want to sacrifice the beets. Turns out I should have as they all fought for space underneath the ground. Oh well, maybe another year. Cauliflower is a new one for us, though. I’ll have to think about that for our “challenge crop” this year! 🙂 Thanks so much, Dawn! You are the carrot cake master! I love this idea and I’m a lot like you – I have only made cinnamon rolls with a yeast dough. Time to give a quick version a try. 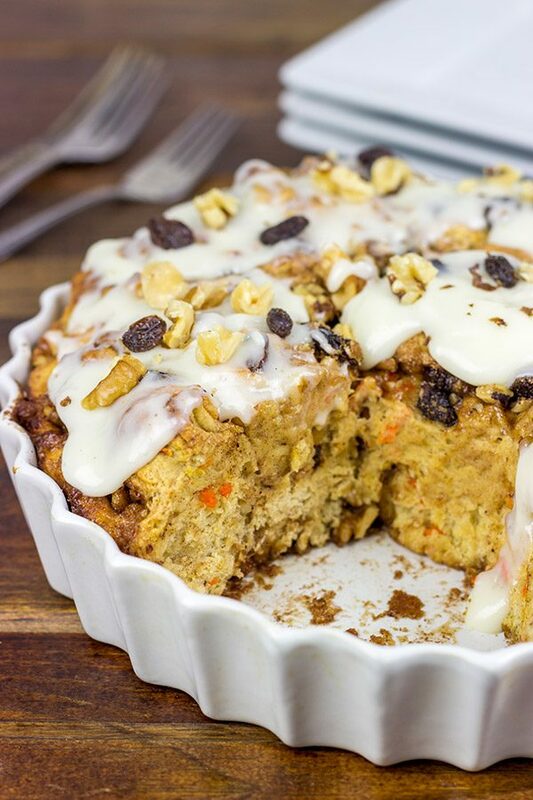 These carrot cake cinnamon rolls look amazing! Haha! I’m flattered by the carrot cake master title, but in truth I think it’s because I just eat too much carrot cake. 🙂 I also love cinnamon rolls, so the combination of the two was pretty darned fun. Definitely give ’em a try, Kathy! That’s so cool that you grew carrots! I aspire to be a gardener one day but at this point I kill every plant I try to grow :(. Therefore, I’ll just have to buy the carrots I’ll use in the cinnamon rolls because I NEED them in my life. They look so soft and fluffy and even though I never crave sugar this early I totally am craving these right now! So I think you might kill every plant you grow because you live in the middle of a desert. I mean it’s like 150° there in the summer! Nothing will grow well in that. Except maybe a cactus. 🙂 So these carrot cake cinnamon rolls turned out quite well…even with no yeast. I think I’m going to make another batch for Easter morning. Thanks, Kelsie! My mouth is watering just at the thought..why didn’t it ever occur to me baking soda/powder could perhaps sub for yeast? Hmm. These look so delicious David, I just want to go out and buy some carrots (because I don’t plan ahead well enough to plant them :(. Pinning! I totally agree with you here, Laura! I must admit that I was skeptical when I got the recipe, too…but it worked. I actually enjoy baking with yeast, but I still want to play around and see if this baking soda/powder combo can work for other things, too. And these cinnamon rolls turned out really well…in fact, I’m thinking about making another batch this weekend! Here you go again David, trying to destroy my diet. I love carrot cake I love cinnamon rolls, so this combination is tugging at my heartstrings. Wow, you grew carrots??? I can’t wait until I start my very own garden. I’ve never seen carrot seeds either David. Your carrots are super cute, I love that they are not perfect, who like perfect? I surely don’t. Wow, these cinnamon rolls are yeast free? Now I really have to try them. Have a great week my friend. Confession: I’ve never had luck growing carrots, but yours look great! 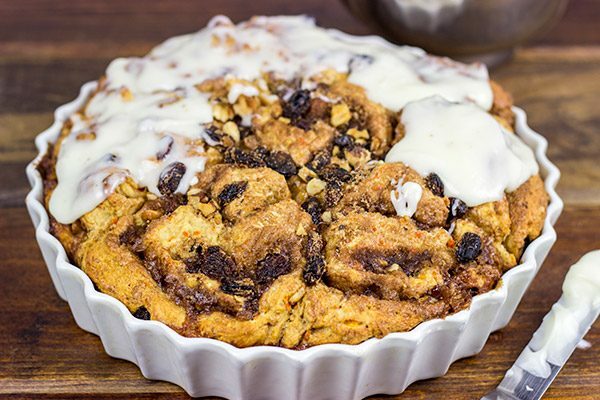 And this is a really mouthwatering way to use them – love this twist on cinnamon rolls! Well that’s good to know that others have had trouble with carrots, too. I mean those look fun, but they’re nothing like the carrots from the store. And I had a bunch that barely did anything…like maybe 1″ long. Oh well. But these cinnamon rolls totally turned out well. In fact, I’m thinking another batch might need to be in order for Easter weekend! Thanks, Marissa! I know! I was totally thinking about you when I wrote that about the rabbits. Why in the world did the rabbits not go after our carrots!? Maybe it’s because they’re under the ground? It doesn’t make sense to me either, Ben! Either way, these cinnamon rolls turned out quite well. And I like the idea of your scientific experiment. I bet the rabbits don’t touch the cinnamon rolls in the backyard…but I wouldn’t be surprised to see a Ben coming through sneaking one or two. Haha! I gave up growing carrots in my garden years ago. I have never made sweet rolls without yeast before. These sound really yummy and interesting. I am going to have to give them a try. Yeah, I had fun growing something new, but I don’t think we’ll do carrots again this year. I always like to plant a “challenge crop” so I’ll have to find something different this year. But, yes, these cinnamon rolls turned out really well. I’m planning on making another batch for Easter weekend! Thanks, Dawn! I am looking for something healthy to serve my guests for my birthday next month – this looks perfect! Haha! So I don’t know how healthy these carrot cake cinnamon rolls are, but I can promise they are delicious. 🙂 Thanks, Marina! DUUUUDE – CONGRATS!!!! Growing carrots from seedlings is fantastic! And they can join the bunch of misfit-carrots I had last year! BTW – how do store-bought carrots and farmers market carrots really grow so long and gorgeous eh? But – homegrown carrots somehow always trump store bought ones in taste – at least that’s my two cents. And – what a genius use of them these rolls are! 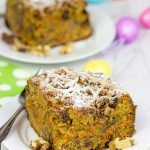 I have seen carrot cake cakes/cupcakes/cookies/blondies and bars – these are the first carrot cake cinnamon rolls I’ve seen and what a delicious treat for this Easter Weekend! I happen to like yeast-free cinnamon rolls myself and I’ve gotta put these on my list! Genius, my friend! Simply Genius! You grew carrots last year, too, Shashi? I missed that! I did enjoy growing them, but I think I’ll pick a different “challenge crop” to try in the garden this year. Not sure what yet. Hmmm…what else can I incorporate into cinnamon rolls? Haha! So definitely put these yeast-free carrot cake cinnamon rolls (wow, that’s a mouthful to say) on the list…they’re perfect for Easter weekend. Actually, they’re perfect for ANY weekend! 🙂 Thanks, my friend! Now that’s my kind of breakfast ! Amy I allowed to call it healthy because of the carrots? I mean especially homegrown! 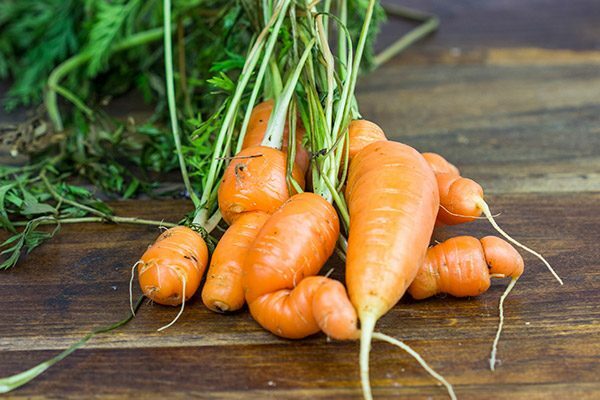 I actually grew carrots once as a kid (my dad let me use a corner of his garden) and they turned out about the same shape and size, but they were so much sweeter than store bought. Anyways, this breakfast dish sounds like the perfect breakfast and another great way to sneak cake into breakfast (Something I am totally down for!)! Hah! Sure, I think you can call this one healthy since it’s got carrots in there. Let’s just not use that term in public, ok? 🙂 Wow, that’s awesome that you grew carrots, too. I agree that the taste was amazing, although I just wish they weren’t so small and runty. Is that a word? Either way, thanks so much for the comment, my friend! Happy (early) Easter to you and Hayley! wow I would have never thought about making cinnamon rolls without yeast! Now I am intrigued, I really need to try this! 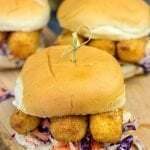 These does look delicious, I would have never thought they were made without yeast! What a wonderful idea it is growing your own carrots! You never have to rush to buy them when a sudden carrot cake craving strikes. 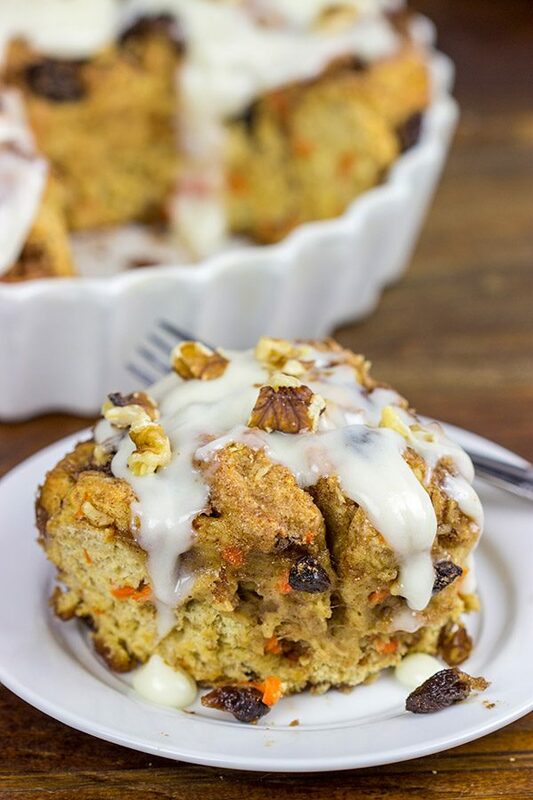 Oh and did I tell you how phenomenal and creative these carrot cake+cinnamon rolls look! Hah! True, and I do know all about those sudden carrot cake cravings. 🙂 I love a good carrot cake…or in this case a good carrot cake cinnamon roll. Thanks so much, Neha!! Sounds like your mother has quite the garden going over there! I’ve never grown spinach, but we do plant tomatoes and beans every year. And I agree…there is just something so satisfying and fun about eating veggies out of your own garden. Thanks so much, Puja!